Ever since @alexlobov told me about this place last year, I had been curious to try it. Sushi in the shape of a burger? What’s not to like!? It’s a marriage of Japanese flavours with Western form and function. It’s a type of fusion that instantly works, unlike some forms of culinary fusion, where different flavours are mashed together in a strained combination that is intriguing, not not always successful. I met up with Mr D for dinner, and as is our trademark routine – mostly caused by my indecision, and enabled by his easy-going passivity – we wandered around the city looking for somewhere to eat. When he suggested J Cafe, which he referred to as ‘that sushi burger place’, and which I think should be named Sushi Burger anyway, I agreed. I’m so glad he knows me well enough to have a backup plan in mind. J Cafe is one of those cute little Japanese places, where the tables are closely packed, there’s a lot of warm blonde wooden furniture, and exceedingly polite Japanese waitresses repeat your order back to you while nodding and adding a questioning ‘yes?’ after reading each item, seeking your confirmation. It’s all very charming, I think. 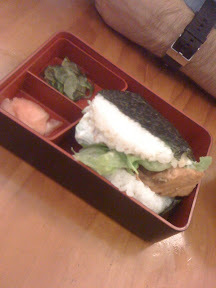 We both decided to go for the Sushi Burger Box, which comprised of a sushi burger, another dish, and miso soup. For $17, it’s not bad, but there are definitely places nearby where you can get more bang for your buck. The burgers come wrapped up in paper, a cute touch. This place is all about the kawaii factor, it seems. I ordered the spicy raw salmon burger. It’s kind of like a round onigiri, with a nori taco wrapped around it. 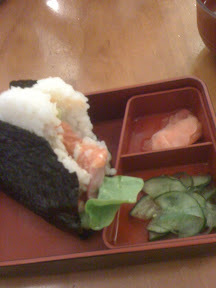 When it comes down to it, it tastes like a fresh hand roll, only the nori is still a bit crispy, which I like. Mr D had the teriyaki salmon burger, which he was very happy with. I can always tell when Mr D likes what he’s eating, because he eats it rather rapidly, and makes something of a mess. One little thing that irked me about the sushi burger meal was the fact the second dish was served after the burger, as though the burger was the entree. When the second dish arrived, without any rice accompaniment, it felt a little strange. 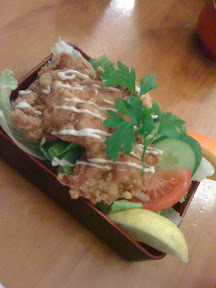 Especially since I ordered the Tatsuta Age – yep, the fried chicken. I love fried chicken, but it needs a carb-based accompaniment (for full obesity-inducing impact). This chicken was tasty and juicy, and the mayo drizzled across the top certainly didn’t harm its performance in the deliciousness stakes. I just wish it had come at the same time as the sushi burger. 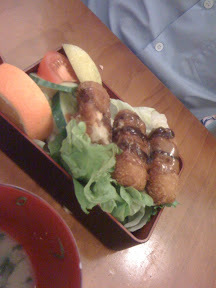 Mr D had the Kani Croquette (fried mashed potato croquettes with crab meat). Again with the speedy eating and the bit of a mess. To be honest, I think he was much more excited about the croquettes than the sushi burger. J Cafe also serves up your standard Japanese bento dishes and sushi, but I think when I go back next time, I’m definitely having another sushi burger. So this place has the dubious distinction of being the first restaurant I have double-reviewed. The first time I went there, I had the ramen, which was something of a disappointment. So this time around, when I went on a date with Mr J, I was decidedly not going to go down the noodle route. Besides, eating noodles on dates is for whores. You know what I mean. We started off with some gyoza. Now I realise it’s a style thing, and that gyoza are not jiaozi, but it always bothers me that gyoza filling is kinda loose – it makes me thing that they’re under-cooked. These gyoza were no different. Not to say they were bad – indeed the flavour of the filling was quite good – but I’m starting to think this Japanese staple isn’t really one of my favourites. 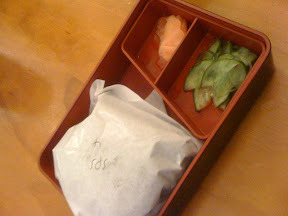 Mr J was feeling indecisive, so he ordered the bento, which had a little bit of everything. It looked like a lot of fun, though I’m not sure how anyone could eat that much food. Wait, anyone except me. Luckily I didn’t order it, because I’m sure I would have hoovered it all up. And hoovering on dates is for whores. You know what I mean. FYI Mr J did not hoover. He’s not a whore. I ordered the buta something or other. It was like a pork sukyaki, in a cast iron bowl with, swimming in porky broth. It was really good, though the vegetables were a tad over-cooked, and a bit of a floppy mess. Still, the flavour was simple, but somehow not bland. I quite enjoyed it, though I didn’t finish it. Partly because the serving was very generous, and partly because I didn’t want to look like a whore. Phone: 9663 8118You know a place is an ‘institution’ when they’re selling branded merchandise (read t-shirts) at the cash register. Izakaya Chuji is one of those places. One of the first izakayas in Melbourne, if not the first, Chuji – as my friends and I refer to it – has been around since 1989! I first started going there during my uni days. Back in the heady days at the turn of the millennium, when all things Japanese were cool, Chuji was our favourite Japanese restaurant. The food was good, the prices low, and we were far too busy playing out the dramas of our young adult lives to care if the service was not so great. Last time I went to Chuji, it was a catch up with Mr I. We’ve known each other since the uni days, so Chuji’s one of our fall-back places when we catch up. I ordered the agedashi tofu to start. Agedashi tofu is a favourite dish of mine, and Chuji puts out a good version, though I think the decision to thicken the dashi sauce – which has happened somewhere in the last couple of years – is a bad one. I don’t like the fact that so much sauce clings to the fried tofu. Also, the choice of carrot as a garnish instead of bonito flakes is a little disappointing. The tofu, however, is fried well, and manages to reach the table still crispy. I also ordered the mixed kim chee, because I thought I might need some vegetables. See mum, I DO eat vegetables! These weren’t great – the various vegetables had a very similar flavour, except the chinese cabbage kim chee, which had some more chilli to it. Anyway, it was altogether too sweet. I guess that’ll learn me to order kim chee at a Japanese restaurant, and not a Korean restaurant. Mr I had the cheese gyoza from the specials board. They’ve been on the specials board for months, by the way. We saw them there last time, but no-one was quite brave enough to order them. They were actually pretty good, however. The switch from soy sauce to mayo was a good move, and the fact they’re deep-fried is also wise. Pan-fried ones would have had an oily, soggy texture, I think. Mr I also had the yakisoba. I personally don’t like yakisoba – I think it’s probably my least favourite of the various Asian stir-fried noodles. But it’s not the first time he’s had it at Chuji, so I assume he likes it. I was in the mood for some more fried goodness, so I had the curry katsudon. The pork was a little on the dry side, but the curry was delightfully rich, even if Japanese curries are the biggest wimps of all curries. Izakaya Chuji is a reliable stalwart, serving decent Japanese food at very reasonable prices. It’s not pretentious, but it’s similarly not impressive. A good relaxed place to eat and hang out with friends.